Detroit: The "Arsenal of Democracy"
In 1940, President Franklin Roosevelt urged the United States to become the “arsenal of democracy,” arming democratic nations against the looming totalitarian threats of Nazi Germany and Imperial Japan. It took ingenuity and perseverance under difficult circumstances, but Detroit answered the call — producing 30 percent of the war material generated in the United States before the end of the war in 1945. 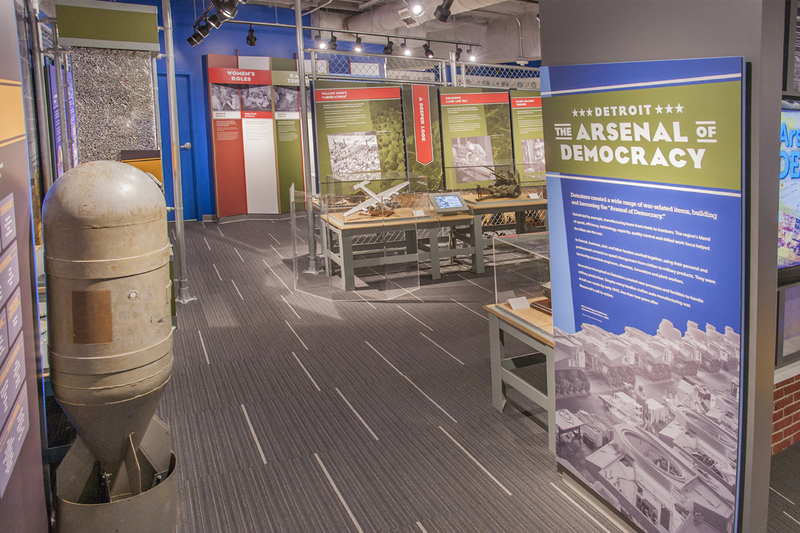 The new Detroit: The “Arsenal of Democracy” exhibition explores the ways that Detroit shaped the outcome of World War II — and how the war changed Detroit. The gallery is divided into three main sections, representing the arenas where Detroit was linked to the war effort: the factory, the community and the home. It delves into rationing, victory gardens, allied propaganda, and other ways the war overseas altered the daily existence of everyday Detroiters. While Detroit helped change the character of the war, the war had significant repercussions on the city as well. Over 700,000 residents toiled in factories — many for the first time. People came from all over the country to fill job vacancies. The burgeoning population put a strain on municipal services, while overwork, overcrowding and rationing put a strain on the people. World War II touched every Detroiter. From soldiers to young scrap collectors, everyone pitched in and got involved in the war effort. In turn, the war changed many things in the city, and affected how Detroiters lived. Some changes were good — after the tough Great Depression, unemployment virtually disappeared. Other changes were tougher to live with — loved ones in the service, food and gas rationing, and overcrowding. Through it all, Detroiters persevered and made the best of the sacrifice. This is one of the greatest stories in the history of our region and we’re excited to feature it in the Museum in a way that underscores how victory despite adversity was — and should continue to be — a source of pride for all Detroiters.